The capital city probably wouldn't have featured on our itinerary if Gilly hadn't had friends living there. 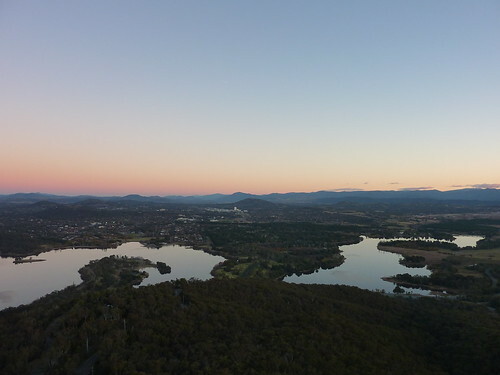 Canberra is basically one huge government business park, but has the benefit of being surrounded by national parks, mountains and stunning views. We picked up our hire car from Hertz at Sydney Airport, and after the usual 10 minute scare tactics to try unsuccessfully to get us to buy liability insurance, we were on our way in an almost new Toyota Corolla. I'd never driven one before, but it was a dream, especially since it was an automatic. I just had to point it in the right direction, and not exceed the speed limit - something quite difficult to do when the engine is barely making a noise at 110km/hr. We got to Catrin and Pete's at about 3pm. The weather was cold - a good 10 degrees chillier than Sydney, which we'd thought was getting on the frosty side. How quickly our bodies get used to warmth! Our hosts thought we'd soon warm up by climbing a mountain, so we took a drive out to Mount Taylor, and hiked the near 856 metres to the top. 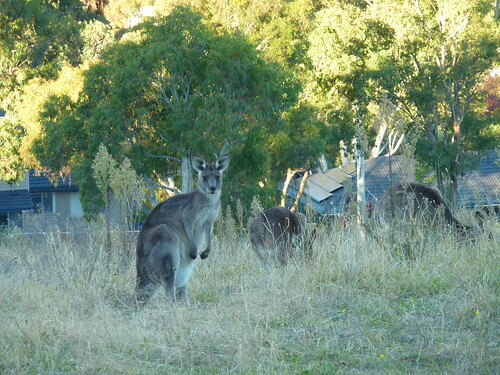 The path was steep but well-trodden, with kangaroos a-plenty on the way, and I was soon removing scarf and gloves, and wondering why I'd bothered to bring a fleece in addition to my huge warm hoodie. 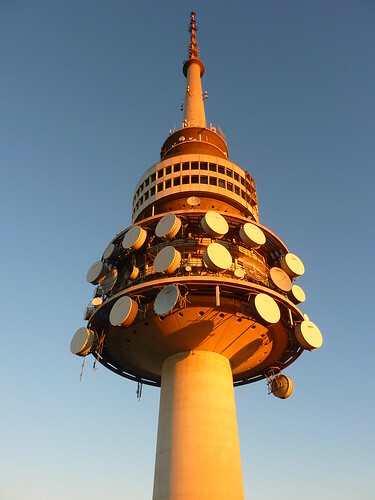 As the sun was soon setting, we drove up to the Telstra Tower, a huge tower affording views of the entire area, which you can see on the mountain in the last photo. 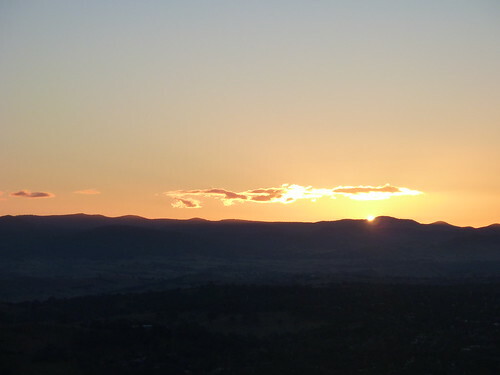 We were just in time to catch the last glimpse of the sun before it disappeared behind the mountains. 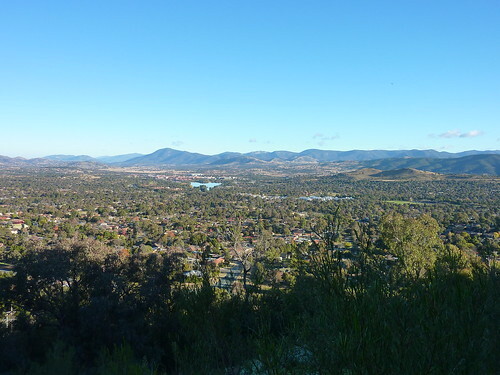 The views were great - the Black Mountain, on which the tower sits, is one of the three points from which the people who planned Canberra stood looking down into the valley, working out where to stick the capital. 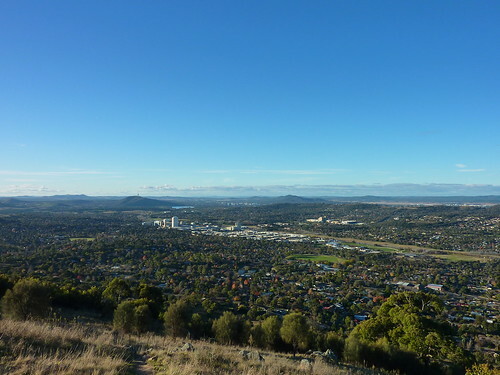 The other two are Mount Ainslie and Red Hill. 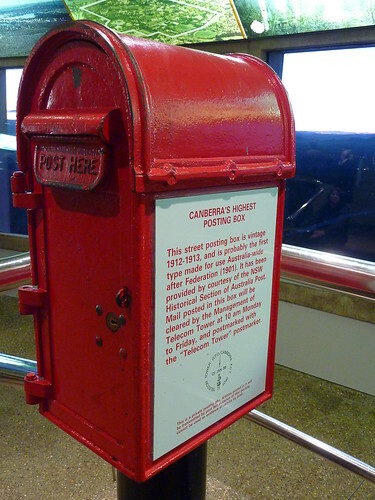 Fun Fact: The tower is also home to Canberra's highest postbox. If I'd had anything to post, I'd have done it here. No idea what the collection times are like, though. We had sublime fish and chips from a chip shop not far from the house, and Pete and I finished the last of my birthday Glenfiddich (strictly in the interests of keeping the weight down on our flight to Melbourne, you understand) whilst being introduced to the delights of Boston Legal. The next day Catrin and Pete were both working so we had a free day to explore the city. 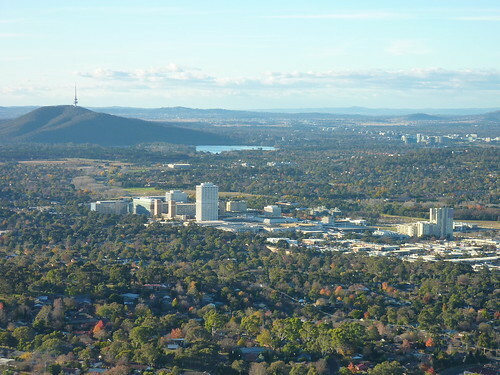 I noticed two things: the city is incredibly quiet in the day time (it made Cairns look like Hanoi), and Canberra isn't really aimed at tourists. You would need a car to get anywhere; I'm not sure what routes the public transport takes, but I don't think I saw a single bus during the entire day. It's not a place I would ever want to live, but I can see the benefit for those who do stay here. It's not noisy or bustling, there are enough amenities to keep people happy, and it's got some great places to walk and jog. It's just not for me. 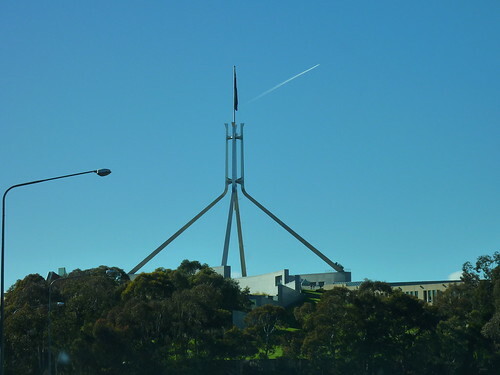 The first place we went to was the National Film and Sound Archive, a collection of galleries showing the development of Australia as a broadcaster over the last century. There was even an alcove playing an old episode of Neighbours, where Scott and Charlene (Jason and Kylie) got married. I was 6 when that was made, so probably 7 or 8 when it came to the UK and I remember watching it with my mother who was a huge fan. It's funny how many Neighbours stars have made it "big" in TV, music and film - Alan Dale (Jim Robinson) is now a guest star in practically every US television show running, as well as having 5 minutes next to Harrison Ford in the last Indiana Jones movie. Kylie Minogue (Charlene Ramsay) is a megastar pop singer. Guy Pearce (Mike the mechanic) has been in a series of excellent films including Memento, and the upcoming Prometheus. And Ed Maclachlan (Henry Ramsay) was in Bugs in the 1990s. Ah well, you can't win them all. Moving on, we went to the National Museum which was huge and quite easy to get lost in. There were a lot of exhibitions about aboriginal rights and the removal thereof by colonials, and the country does seem to want to progress in this respect, but the populace as a whole is going to take a lot longer to stamp out the underlying racism and bitterness inherent amongst some of its citizens. 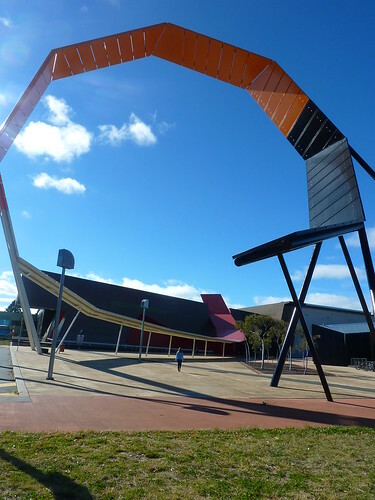 Other exhibits charted Australia's growth and the development of its cities, which made a nice change from a lot of museums which focus on the same tired collection of fossils. There was a quite bizarre sculpture outside the front too. We had lunch at the excellent Lemon Grass Thai restaurant in the CBD, before going to the National Art Gallery to round off the day. There was an excellent series of photos from Scott's Antarctic expedition as well as others taken on the continent a century ago. 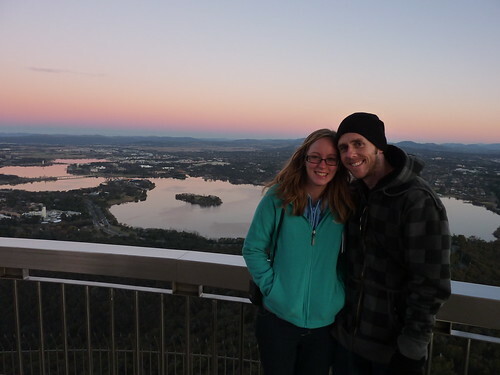 We headed home to prepare for our flight the next day to Melbourne and the next day said goodbye to Catrin and Pete before driving to Sydney, dropping off the car, and jumping on the plane. Paul and Fi warned us that they got stung by Cheapa Campa (also owned by Apollo, who provided the Hippie Camper vans we took down the east coast) for $70 to pay for bedding for their campervan in Melbourne: the same van we have already booked and paid for. Call me crazy, but I would expect a van that you sleep in to come with all of the necessary bedding, without the need to pay extra for it - and their website certainly indicates that bedding is included. However, after 30 minutes of waiting on hold/being cut off, the sole operator (for there is only one person working after 5pm, bien sur) told me that we were unlikely to get anywhere with our complaint, even though the website is misleading. This is the kind of top notch service any customer would love to receive. On a positive note, we were embarking on our second CouchSurf of the trip in Melbourne, staying with a motivational speaker named Mark who had kindly agreed to host us. We thought it would make for an interesting few days!